One of our family friends send us a tray of an Arabic traditional sweets for Ramadan occasion , the one with orange, and yellow color we call it(Zalabia),and the other sweets are(Baglawa). This tray is enough to feed more than 20 people! 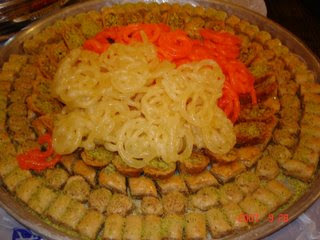 and for me if I kept eating from this tray I wont end up eating until one month! they are tasty and k i l l e r!.